If you are following our website, no doubt you’ve noticed numerous articles referencing Florence McClung, English Teacher at Union High School. Perhaps it’s time to devote one article to this remarkable teacher who impacted the lives of so many students, both in and out of the classroom. In some respects, it will serve as my personal tribute to her, but there is so much to share about this unique woman who touched the lives of her students in such positive ways. Miss McClung was indeed a character as noted by Hans Bonnet, foreign exchange student from Holland. She was the “energizer bunny” overseeing extra-curricular activities that spanned the spectrum of directing junior/senior plays, one-act plays, oratorical competitions to organizing rummage sales, making apple cider, and other fundraising events. She directed these activities with an enthusiasm and energy level that kept us on our toes. Some might say more like a commanding officer, but she made sure we got it done and that it was done right. 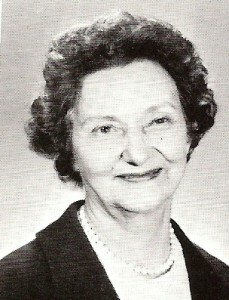 She had a competitive spirit and instilled that competitiveness in her students. Miss McClung’s English classes were run much the same as the extra-curricular activities. She had command of her classroom, leaving us a little afraid. She knew her subject matter well and expected us to learn it. My sister, Patty Leach Hancock, and I have spoken often of Miss McClung’s teaching methods and how much we learned. We both admit that what we learned in her English class provided a strong foundation for the positions we held throughout our careers. I have never attended a class reunion without someone sharing a Florence McClung story. To this day, Linda Elmore can still recite Edgar Allen Poe’s, “Annabelle Lee,” because Miss McClung had her memorize and recite the poem to the entire class. Linda remembers shaking in her boots that day, and I remember shaking a little myself when I had to recite something she had assigned to me. Unlike Linda, I don’t remember the subject matter but I sure do remember Miss McClung interrupting me and pointing out that I was mispronouncing the word, “feeling.” She reminded me that the word “feeling” has a long (e) sound as in “I am feeling fine today”; while the word “filling” has a short (e) sound as in “I am filling the bucket with water.” After that explanation, she then had me pronounce the word correctly, not once but twice. I may have remembered this incident because I was being corrected in front of the entire class, but I know I never forgot that little lecture. To this day, I give that word, “feeling,” a long (e) sound. Linda Short recalls those days when we made cider to raise money for class projects. Linda claims we were throwing rotten apples in the cider bin. If we did that, I’m sure Miss McClung didn’t see it happen or we would have paid a heavy price for that. When the subject of cider comes up, I always remember my first attempt at selling cider. It was a Saturday and I went to town with several jugs of cider. I walked up to a man I didn’t know and asked him if he wanted to buy a gallon of cider. He said, “that stuff makes me puke.” His response would have ended my career at selling anything had it not been for Patty pointing out that I had approached an inebriated man. He may have been Union’s version of Otis in Mayberry, or, maybe he ended up with one of those jugs that had the rotten apples. Patty and I still laugh at this today. I believe everyone who was a student of Florence McClung would agree that she ran a tight ship at all times. She took her responsibilities as a teacher seriously – you could hear a pin drop in her class. As John Kidd said, “She sure straightened me out.” Or, as Rhonda Wiley said, “I was afraid of her and only had her my senior year, but wished I had had her for four years.” She was a no nonsense teacher and you learned real fast to behave in her class. Have you ever wondered how Miss McClung would have handled what we call “bullying” today! I bet you’re thinking the same thing I am – WOULD THEY EVEN DARE!!!! Yes, Miss McClung was a serious teacher but she had a humorous side to her as well. One day she told our class about walking down the sidewalk in Sinks Grove and her half slip fell around her ankles. She said she stepped out of the slip, put it in her pocket, and kept on walking. There were times in class when some of the guys would tease her a little, or say something funny, when she wanted to be serious. I could see her trying to stifle a laugh and return to serious mode, but knew she just wanted to giggle with the rest of us. Thanks for the memories, Miss McClung.